By signing up to receive any of our free resources, subscribe to our newsletter, register for a webinar, seminar or a live event, you agree to receive emails related to the opportunity or free resource you opted in to receive, including its content, updates, changes and other opportunities. If you are located outside of the 32 countries affected by the GDPR (the EU, EEA and Switzerland), when you subscribe, or if you opt in to receive any free resources, register for a webinar, seminar, a live event, or purchase products sold by us, we will automatically enroll you to receive our updates by email about upcoming events, news, time-sensitive opportunities and other information we may send. However, you may opt out of receiving any, or all, of these communications from us by following the unsubscribe link or instructions provided in any email we send. If you are located within the GDPR-affected countries, we will only enroll you to receive our updates by email about upcoming events, news, time-sensitive offers and other correspondence if you affirmatively consent to it. Should you change your mind and do not wish to receive our emails, you can opt out of receiving any, or all, of these communications from us by clicking the unsubscribe link at the bottom of every email or by following the instructions provided in any email we send. Information on this website is provided for educational purposes only and is not intended as a substitute for the advice provided by your physician or other healthcare professional. You should not use the information on the website for the purpose of diagnosing or treating a health problem or disease, or prescribing any medication or other treatment. This website does not contain information about all diseases, nor does it contain all information that may be relevant to a particular medical or health condition. Never disregard medical advice or delay in seeking it because of something you have read on this site. You should always speak with your physician or other healthcare professional before taking any medication or nutritional supplement, or adopting any form of treatment for a health problem. Information provided on this website DOES NOT create a doctor-patient relationship between you and either Dr. Peter M. Elias or Dr. Mary L. Williams or with any other health care professional associated with this website. While every reasonable effort has been made to ensure that the information provided in this website is current and accurate, the authors and website administrators assume no responsibility for the accuracy and correctness of the information on this site or for any consequences of relying upon it. Such information is often presented in summary or aggregate form and is not meant to substitute for the advice provided by your physician or other medical professional(s), or for any information contained on or in any product packaging or labels. 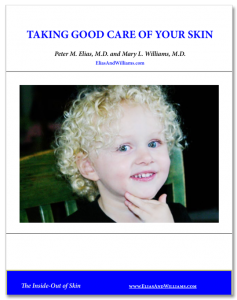 Although EliasAndWilliams.com welcomes questions concerning the skin from its users, the authors do not guarantee that the users will receive a reply, timely or otherwise. No specific advice will be provided about any individual’s skin condition, skin care practices, medications, or other health questions. All information given, including in response to queries from users of this website, is general information and does not constitute medical advice, nor does it create a doctor-patient relationship. This website retains the right to alter the language and edit the content of the questions submitted by users in any manner the website and its authors desire, and to post the questions, altered or not, on the website. Any answers to medical questions provided will not be specifically directed to any individual’s personal medical condition or situation. All material on EliasAndWilliams.com created by its authors is protected by law, including, but not limited to, United States copyright and trademark law, as well as other state, national, and international laws and regulations. EliasAndWilliams owns a copyright in this website as a collective work and/or compilation, and in the selection, coordination, arrangement, and enhancement of this site’s content, and in original content created by and for this website. Except as expressly provided herein, EliasAndWilliams.com does not grant any express or implied right(s) to Users of this site. Removing or altering the copyright notice on any material on this site is prohibited. All original Content is copyrighted by EliasAndWilliams.com, whether accompanied by a copyright notice or not. You may not modify, remove, delete, augment, add to, publish, transmit, participate in the transfer or sale of, create derivative works from, or in any way exploit any of the Content, in whole or in part without the written permission of EliasandWilliams.com. All rights to such Content are reserved to their respective copyright owners. Any such Content may be used solely for your personal, non-commercial use. If you violate any of these terms, your permission to use the Content will automatically TERMINATE and you must immediately destroy any copies you have of any portion of the Content. Restrict or inhibit any other authorized user from using and enjoying this site. Harvest or collect email addresses or other contact information of other users from this site by electronic or other means. Send any unsolicited commercial emails or other unsolicited commercial communications through this site or based on information collected from this site. Use this site to advertise one’s goods or services or the goods or services of a third party. Post, store, or transmit any unlawful, threatening, intimidating, harassing, defamatory, invasive of privacy or publicity rights, obscene, inflammatory, pornographic, profane, or otherwise objectionable information or material, as determined by EliasAndWilliams.com. Use this site to post, store, or transmit any information or software that contains a virus, worm, Trojan horse, or any other harmful or disruptive component. Use this site to post, store, or transmit materials in violation of another party’s copyright or other intellectual property rights. You are solely responsible for determining whether any material you post, store, or transmit is subject to or violative of a third party’s rights. Use this site for any unlawful purpose or in any manner that could damage, disable, overburden or impair the site. Any conduct by you on our website that we believe, in our sole discretion, restricts or inhibits any other user from using or enjoying our website will not be permitted. You agree to use our website for lawful purposes only. You are prohibited from posting on or transmitting through our website any unlawful, harmful, threatening, abusive, harassing, defamatory, vulgar, obscene, sexually explicit, profane, hateful, fraudulent, racially, ethnically, or religiously derogatory content or otherwise objectionable material of any kind, including, but not limited to, any material that encourages conduct that would constitute a criminal offense, give rise to civil liability, or otherwise violate any applicable local, state, national, or international law. You also agree not to use our website to post or cause to be posted petitions for any issue, or to post or cause to be posted any advertisement or solicitation of funds, goods or services. This website, EliasAndWilliams.com, is provided for your use on an “as is” / “as available” basis. We, along with our affiliates and third-party content providers, do not make any representations or warranties of any kind, express or implied, with respect to our website or its Content offered on or through our website or any other website to which our website links, or the uninterrupted or error-free use of our website. We do not warrant that our website or files available on our website will be free from corrupted data, computer viruses or similar destructive or contaminating code. No advice or information provided by us or by our affiliates shall create a warranty of any kind. Your use of our website and any website linked to our website is expressly at your own risk. Our website may contain some materials and/or graphics which may be explicit, unedited, or offensive to you. Access such materials at your own risk. This website, its authors and their information providers, agents, officers, and employees bear no responsibility for such materials and you agree to hold them free from liability for any damages, direct or indirect, resulting from any such materials. You acknowledge and agree that EliasandWilliiams.com and the authors of EliasandWilliams.com shall not be responsible or liable, directly or indirectly, for any damage or loss caused or alleged to be caused by or in connection with use of or reliance on any such content, goods or services available on or through any such third-party web sites or services. The Company is providing these links as a convenience to you. The inclusion of any link does not imply endorsement by the Company, the Website or the Company operators. The Company and this Service is controlled, operated and administered from our offices with the USA. If you access the Service from a location outside of the USA, you are responsible for compliance with all local laws. You agree that you will not use the Company content accessed through this Website in any country or in any manner prohibited by any applicable laws, restrictions or regulations. The information on our website is subject to change without notice. You may include a link from your website, forum, newsgroup, list serve, mailing list, electronic bulletin board, blog or wiki to this website, provided that your website, forum, newsgroup, list serve, mailing list, electronic bulletin board, blog or wiki does not contain illegal, obscene or offensive content. Notwithstanding the foregoing, this website, EliasAndWilliams.com, and its authors reserve the right to demand that you remove any link on your website that, in their sole judgment, would negatively affect the reputation of EliasAndWilliams.com or its authors, Peter M. Elias, M.D. and Mary L. Williams, M.D. This website is an educational and informational service. This site may provide access to materials and information that reside on sites not owned or controlled by EliasAndWilliams.com. Such external sites may include advertisements through which you may be taken to other sites not owned or controlled by EliasAndWilliams.com. This website, EliasAndWilliams.com, has no control over such third-party websites or their content. You acknowledge and agree that the authors of this website, EliasAndWilliams.com, are not responsible for the availability of such sites or resources, and neither review nor endorse any content, advertising, products, services or other materials on or available from such third-party websites. Accordingly, this site expressly disclaims any responsibility for the content, the accuracy of the information, and the quality of products or services provided by or advertised on such external sites or resources. You agree that EliasAndWilliams.com and its authors will not be responsible or liable for any alleged loss or damage incurred by you as the result of any dealings that you may have with any third-party advertisers or websites, including but not limited to communications with such third parties or reliance on their representations, online or otherwise. Under no circumstances shall we or any other party involved in creating, producing, or distributing our website be liable for any direct, indirect, incidental, special or consequential damages or loss of profits, goodwill, use, data or other intangible losses (even if we have been advised of the possibility of such damages) that allegedly result from (i) any delay, failure, interruption or corruption of our website or any data or information transmitted in connection with the use of the website, (ii) personal injury or death caused by your use or misuse of our website, (iii) unauthorized access to or alteration of your transmissions or data, (iv) statements or conduct of any third party on our website, or (v) any other matter relating to our website. You hereby acknowledge that this paragraph shall apply to all content available through our website. Because some states do not allow the exclusion or limitation of liability for consequential or incidental damages, in such states, liability is limited to the fullest extent permitted by law. Notwithstanding the foregoing, total liability of EliasAndWilliams.com for any reason whatsoever related to use of this site shall not exceed $50. We may TERMINATE your access, or suspend your access to all or part of our website, without notice, for any conduct that we believe, in our sole discretion, is in violation of any applicable law or is unreasonably harmful to us, our interests or the interests of another user or a third-party provider. We control the website from our offices within the United States. We make no representation that the website’s Content is appropriate, legal or available for use in other locations. Those who choose to access our website from other locations do so on their own initiative and are responsible for compliance with applicable local laws. You may not use or export the website’s Content in violation of United States export laws and regulations. Any claim relating to the website, the services provided through the website or its Content shall be governed by the laws of the State of California. If a dispute should arise between you and us, you expressly agree that exclusive jurisdiction and venue lie in the state or federal courts located in San Francisco, California. All funding and support for the website is provided by the Elias Williams Medical Corporation, a private medical corporation. This website does not permit outside advertisements, other than those directly related to the professional activities of Drs. Peter Elias and Mary Williams. 7. Notices and claims of copyright or other intellectual property infringement on the site may be submitted by emailing eliasandwilliams@eliasandwilliams.com. Copyright February 2013, by Peter M. Elias, M.D. and Mary L. Williams, M.D. All rights reserved. Any rights not expressly granted herein are reserved.